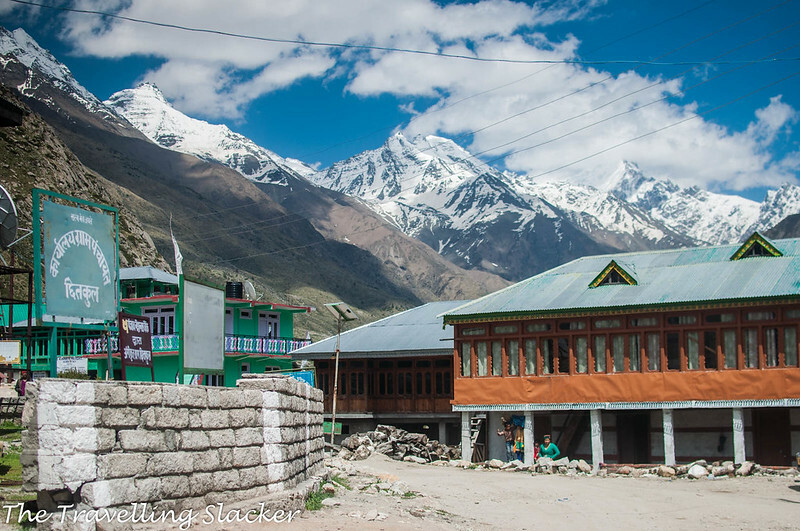 After Sarahan, I decided to see how much Sangla and Chitkul have changed since 2014. But coming out of Sarahan was also problematic. As I’d mentioned in the last post, there was a giant hole on the road and so no dire t buses were running. I waited for buses that were supposed to take a different route. But it was nowhere to be seen, so I just started walking. After a couple of kilometers of a tiresome walk, suddenly a car stopped. It was the couple who runs a small restaurant in Sarahan and where I had food the previous day. They recognized me and gave a lift till Jeori and saved me from a long day of walking. It took a couple of hours more to reach Sangla and I quickly devoured a plate of momo with served with the soup that was complementary and unlimited in these parts. However, a not so pleasant surprise was waiting for me after that. I could not even locate the INR 300 hotel where I stayed last time. Probably that had shut down and given way to fancier ones, all charging 1000 or more for a room. 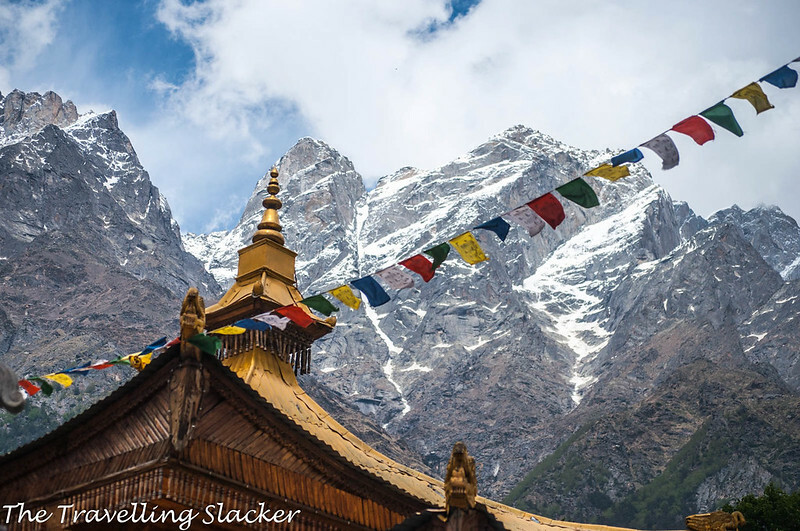 I roamed around the market for a while and then started walking towards Chitkul, planning to keep checking the hotels en route but all of them turned out to be of the same range. 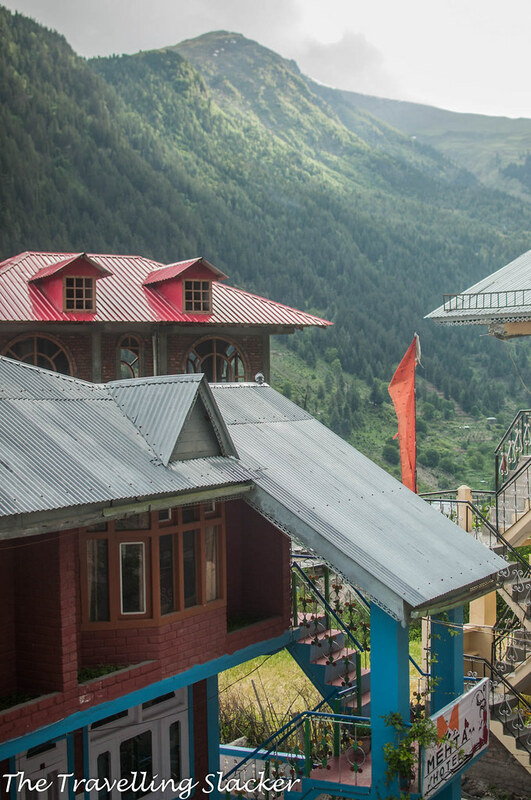 Eventually, I located one that had rooms for INR 400 but he only had 3 rooms, and all were taken by a few Israelis who’d mistaken it for Kasol. Tired and beaten, I started walking back because there was nothing else beyond that and it was already too late to catch a bus and move towards Rakcham or Chitkul. A couple of Isreali girls were also wandering hopelessly, in search of a cheap room. I joined them, hoping to benefit from their bargaining skills. While coming back, they asked another one called Mehta Hotel. I’d bypassed it earlier without asking because it looked too fancy for my budget. However, Shubham Negi, the owner of the place, turned out to be the savior of the day. It was basically a homestay owned by his family. While he had family rooms at higher rates, he had set aside one portion of the building for backpackers. 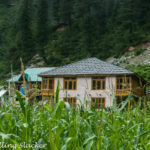 So, those couple of rooms, pretty newly built and furnished, served as dorms with INR 300 per person. The Israeli girls took one of them while I took the other. Each room actually had a place for three but nobody turned up for the next few days so I practically had a very good room with all the facilities and a great balcony overlooking the apple orchards and mountains for myself at INR 300. Having settled down at a good place, I decided to explore the parts that I had missed out on earlier over the next few days. 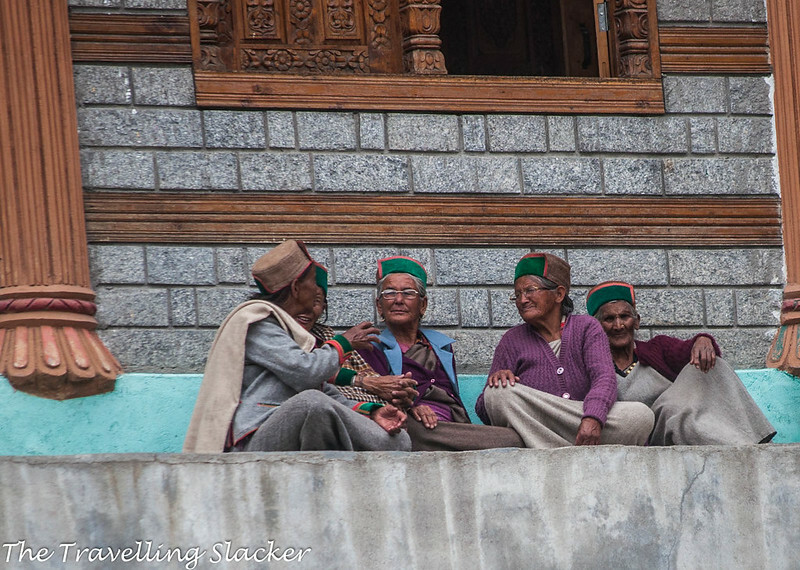 However, a few friends had arrived there on their own trip so I joined them for a quick visit to Chitkul, which also seemed to be going through the same process. Accommodations have become far more expensive and as expected, it was teeming with tourists. I spent no more than an hour out there and came back to Sangla. 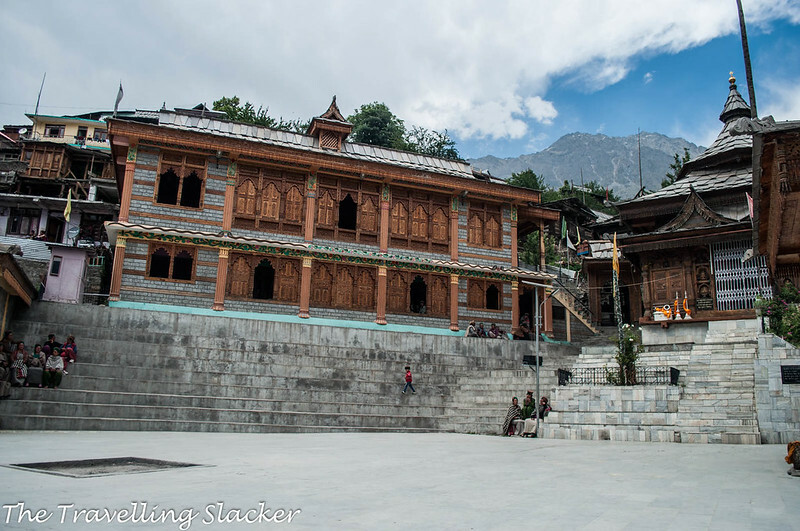 For the next couple of days, I mostly decided to focus in Sangla, especially the cultural side of it and there is a reason why it fascinated me. 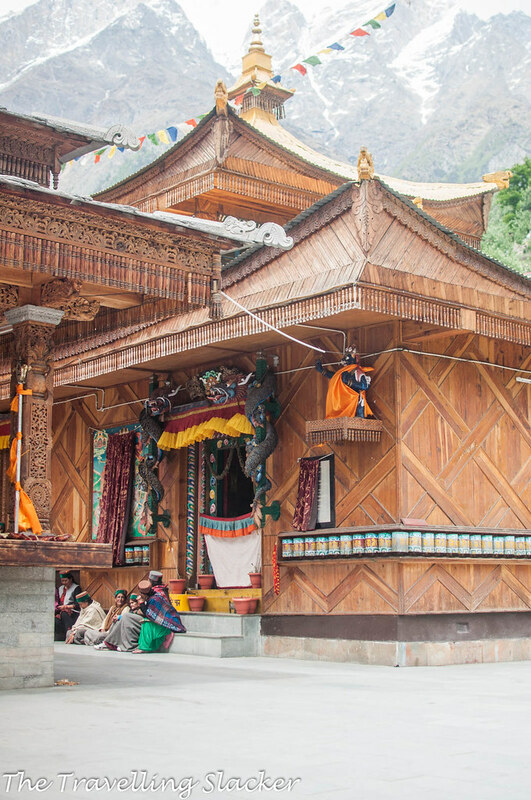 It is because it is one of the best examples of Kinnaur’s composite culture. 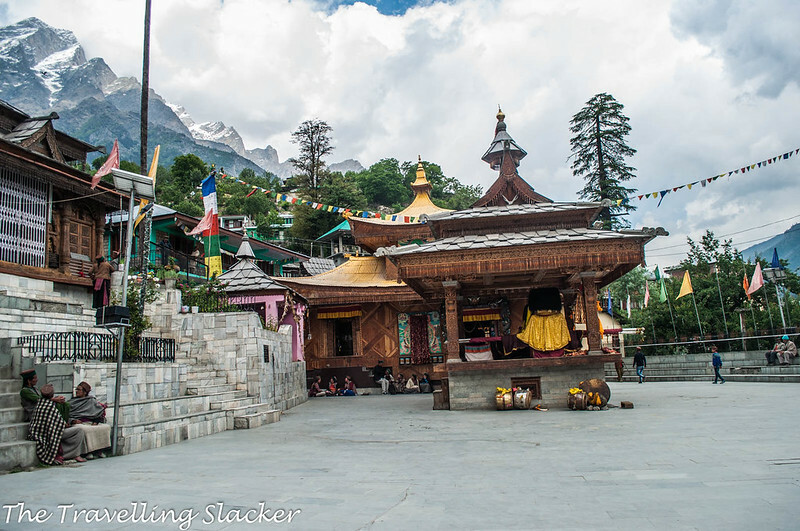 In case you haven’t realized, Kinnaur lies at a very critical juncture, the point where the Tibet (and also the parts of India that follow Tibetan Buddhism), meet the more mainstream, Hindu India. 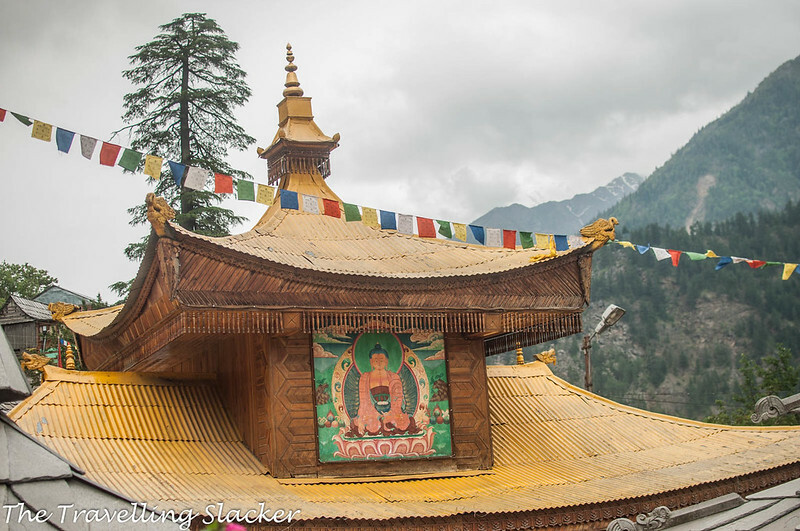 Upper reaches of Kinnaur are Buddhist areas but the lower Kinnaur, especially the area near the border such as Sangla displays an amazing coexistence of both religions. 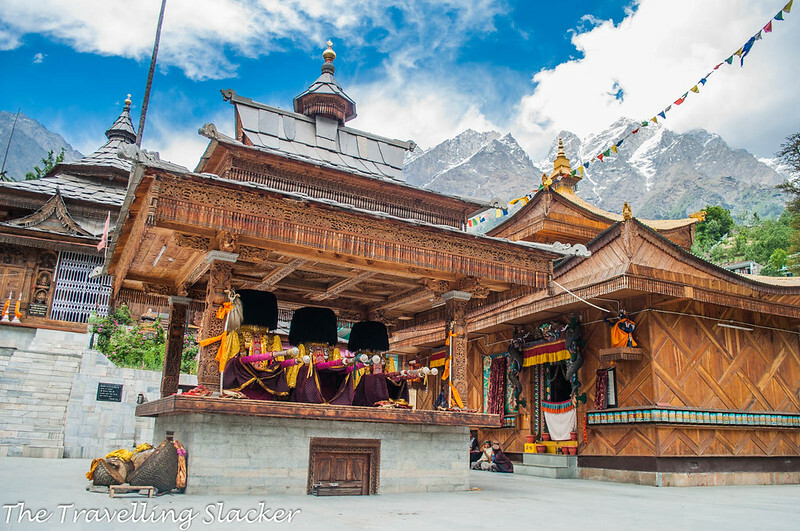 The best way to witness this is to visit the Bering Nag Temple (I am not sure about the spelling. I initially thought it is something like Berinag but everyone seems to be using Bering Nag. It sounds awkward). While the temple relics must be ancient, the temple complex seems to have been recently furnished. 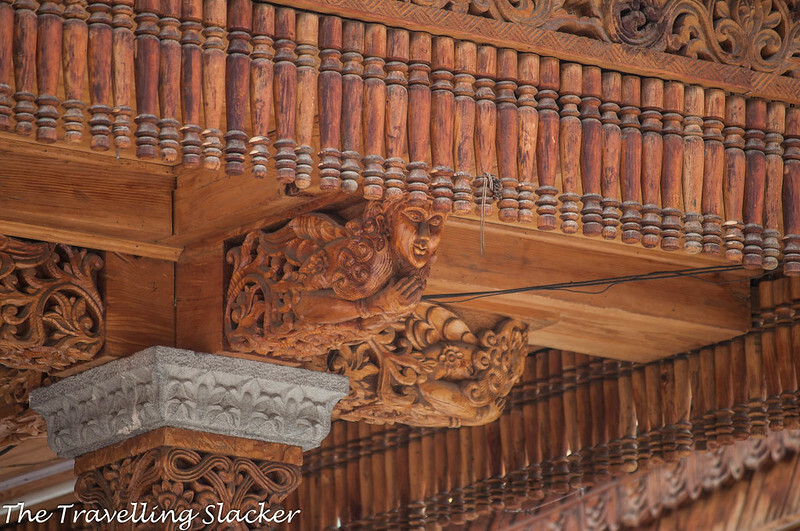 There are some exquisite wood carvings to be seen on the walls and pillars, typical Himachal patterns that I’d seen in places like Chattri, Bahu and many other places before. 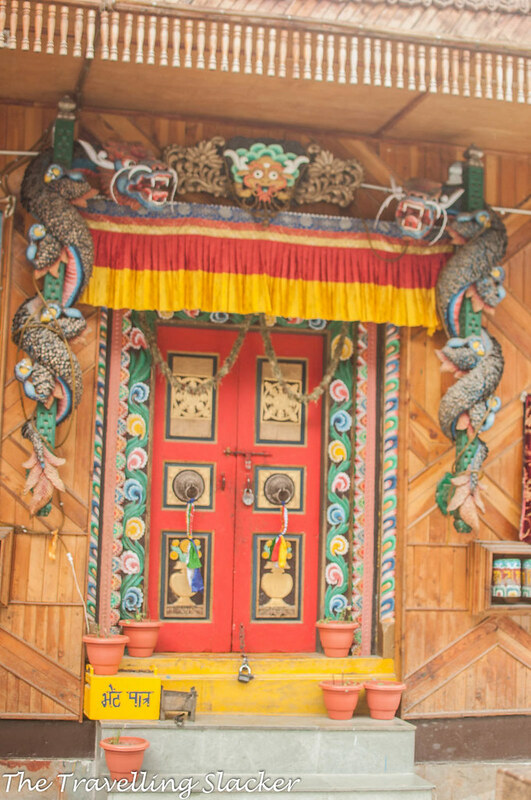 However, interestingly, there is a Buddhist Shrine near it, adorned with dragons on the gate and with a gigantic dharma chakra inside. Concrete floor and stairs doubling up as gallery also seem to be recent attractions. Luckily a ceremony was taking place when we first visited. Locals were sitting on the gallery something big was going to take place. I quickly took a few photographs but as the ceremony began, we were asked not to click anymore. Some people designated for the task came out and started playing the instruments like those big drums and horns. There were three palanquins in the middle of the compound, carrying the statues of three deities. 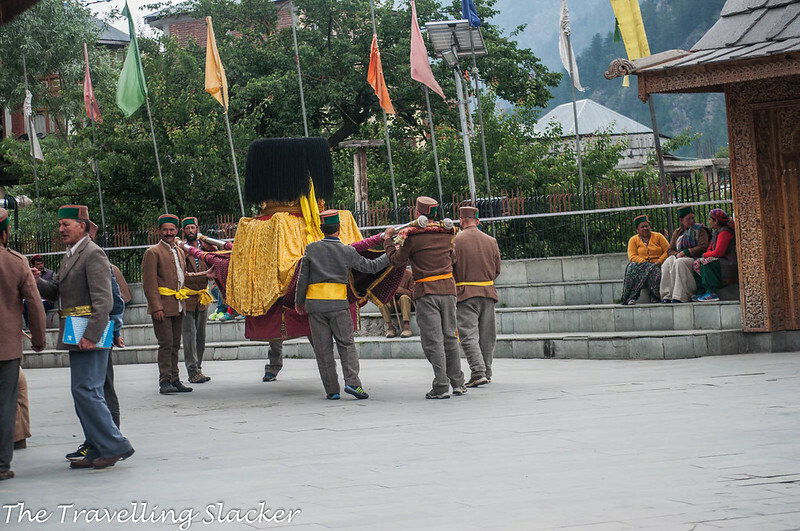 They started to pick up the palanquins one by one and started running around the compound and also rocking the palanquins that seemed pretty heavy. This process went for about an hour. There must be explanations and anecdotes behind these processes that I did not fully understand. Occasionally, other locals also stood in front of the deity and uttered certain words, apparently asking for either blessings or forgiveness. Some other tourists, more talkative and less considerate of the local customs, tried to enter after the ceremony had begun but they have turned away. We were told that there is more to the ceremony and it will last until night but my friends needed to leave (all working people unlike me). So, I also left to see them off at the bus stand. The next day, I returned again with Shubham (from the Homestay). There were fewer people and it was easier to explore. 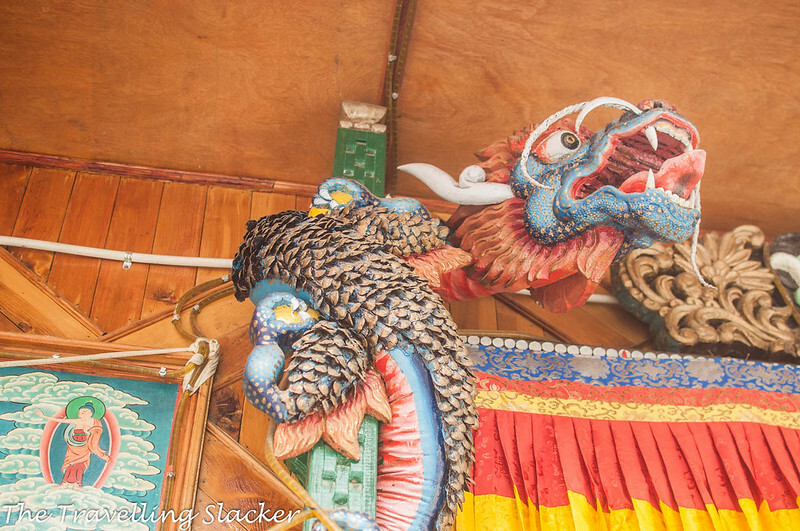 I focused my attention on the dragons and I was told that the scales of the dragons have been made out of scales of pine cones. Can you imagine a better use of pine cones? I found these little details fascinating because they represent remnants of a culture that was secluded and unique, although outside influences are beginning to show up nowadays. That does not mean everything is simple and uncomplicated. 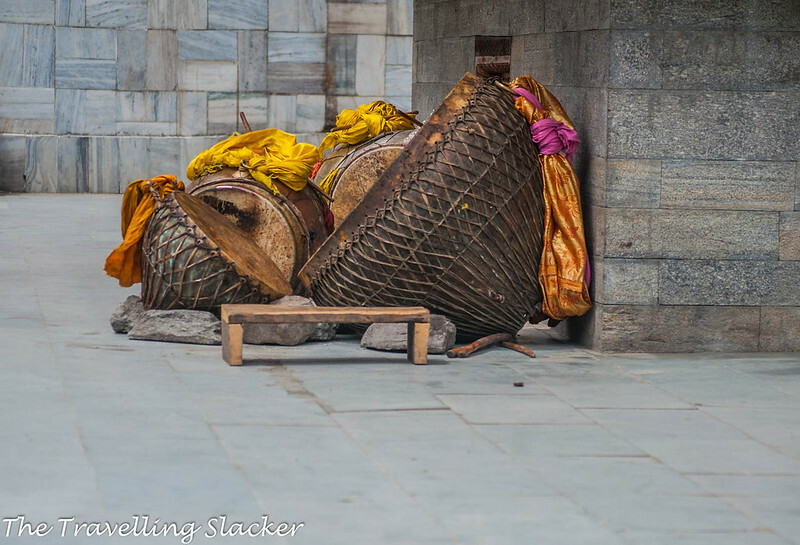 Many of these temples still continue the practice of animal sacrifice, something most urban people will not be comfortable with. But that is also done in many other parts of India and this is a debate that can go on and on. 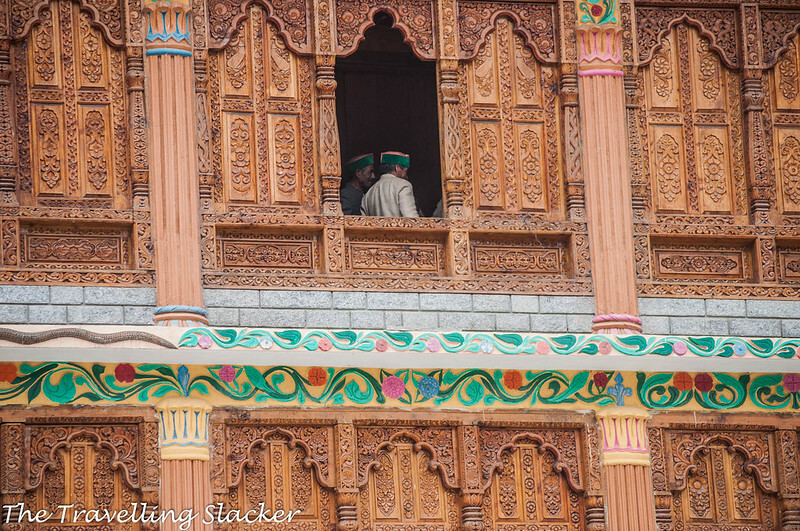 I also had photographed the Kamru Fort, a wooden citadel at a hilltop near the Sangla town. But I can no longer find the photograph. Not sure what happened to that but I will have to return again to do it. 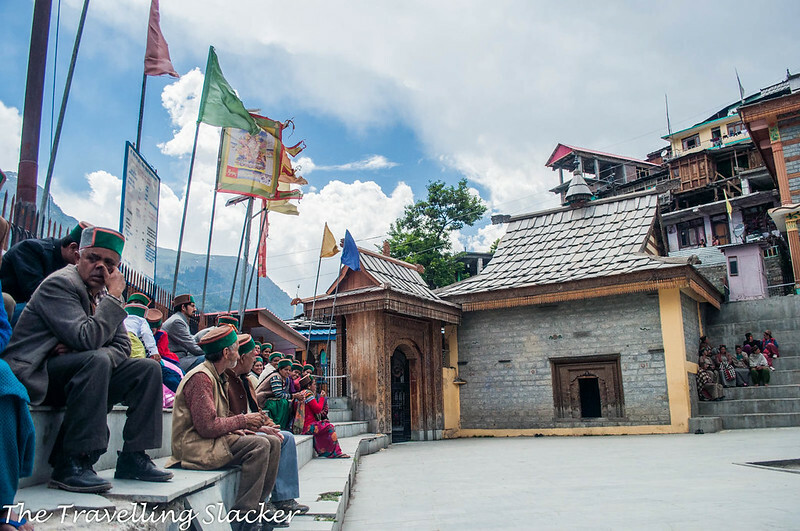 There is another temple near the Fort and also there are more interesting temples in all the villages between Sangla to Chitkul. In case you want to explore, the one it Batseri village, just a few KMs ahead of Sangla, is supposed to be the most exquisite one. I left Sangla with a plan to return, but in a different season, most probably in the winter when everything turned white. I have collected more interesting information that can lead to more interesting experiences during those times. This time I won’t have to run around finding a stay. This looks like such a remote town, but the people seem content. Was it cold there? I only ask because you can see the snow on the mountains! Beautiful colours in your photos, thank you for sharing this place with us! What a stunning place! I would take 1000 photos if I was there. I really like the dragon accents, dragons are some of my favorite creatures! After coming out from a hectic trip ( Saharan ) you really reached to this beautiful town of Sangla. Though a small town but is so beautiful due to stunning snow capped mountains and pure blue sky. This ceremony sounds unique for me and it must be fun to attend ceremonies to understand different cultures and living. A remote place, never knew of it. In almost all your posts I stumble of new places. Feels good. Sad they didn’t allow you to photograph the vent. But yes vivid description. 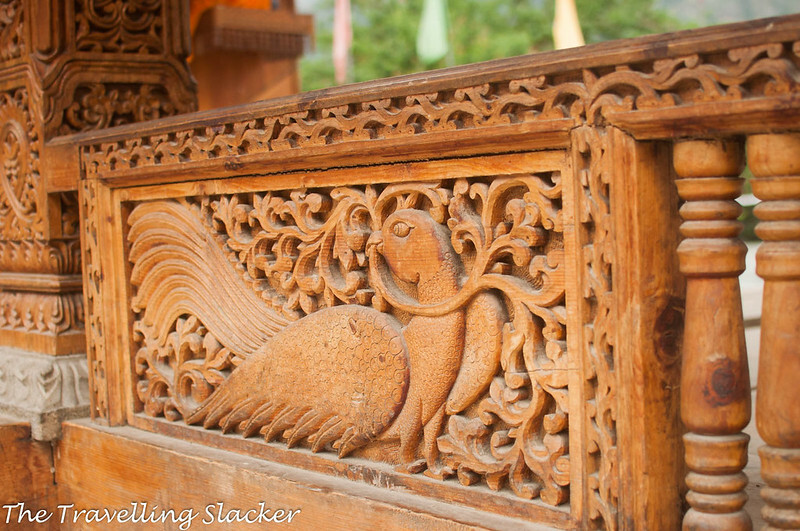 what a beautiful town and such beautiful details on the dragons. I think sometimes even in the remotest of places you find hidden gems. Sangla looks so beautiful and serene. This is the second post on the place I’ve read today. Which is funny because before this morning I didn’t have an idea such place existed! Now it’s near enough top of my list of places to visit. Seems like such a hidden gem with so much culture — definitely yMy kind of place. I’ve visited Sangla recently only in this June, it really is such a serene place. 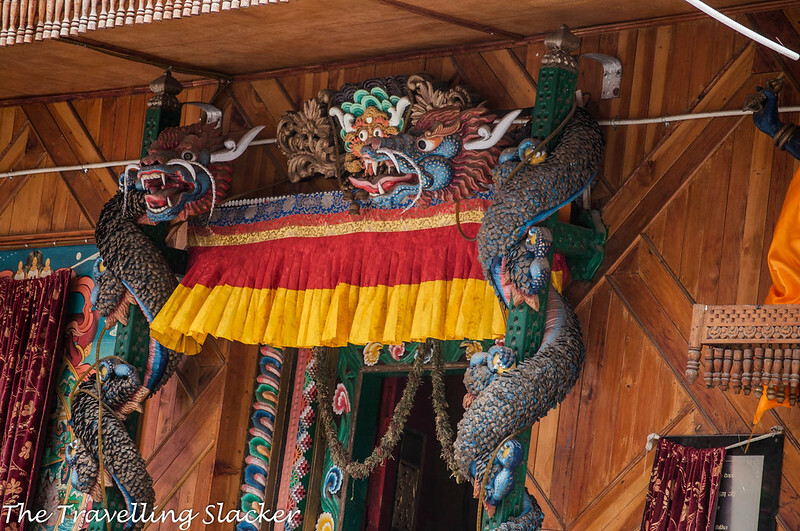 We also visited Bering Nag temple, but the main temple was closed for visitors and we could roam around the premises. You got lucky to witness a ceremony there as our tour guide did mention about the ceremonies there, but of course we couldn’t attend personally. I wish you were allowed photographs of the ceremony, but never you got a tale to tell on that 🙂 Thanks for sharing!! 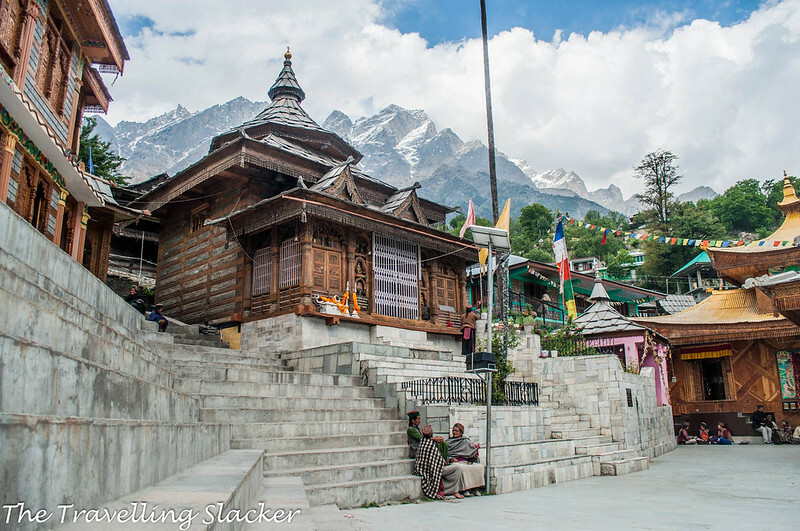 I need to plan a long vacation in Sangla soon.I am yet to explore this region and after reading your post, I am more excited to explore the remote corners of this valley. You have captured some great shots though. Nice read. Great photos too!